Composed of Miss Mary and McHenry Halls, the historic Lyon Complex borders Middle Tennessee Boulevard. This three story building is nestled among trees and is located across from Walnut Grove and near the Kirksey Old Main Building, Peck Hall and next door to the James Union Building which houses one of the main on-campus cafeterias. The Lyon Complex offers its residents study areas, kitchens, laundry rooms, classroom and open lobbies on each floor. The Lyon Complex main floor houses a computer lab and 24-hour help desk. This is an actual shared room in Lyon Complex! Description Feel free to get creative! All furniture in Lyon can be moved; however, there must be mutual agreement between roommates before items should be relocated. Furniture cannot be removed from rooms and must be returned to their original positions before check-out. 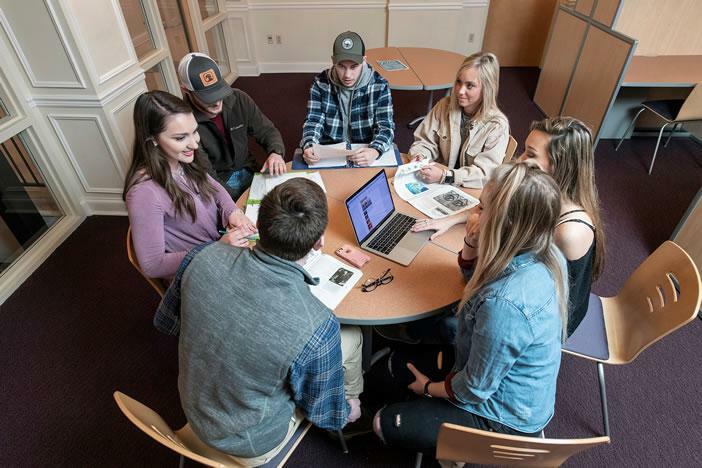 Home to the Honors Living Learning Community, students often utilize the common areas of Lyon Complex for study sessions and group projects. Layout is representative of a typical room. Furnishings and measurements may vary from room to room. Many rooms are the mirror image of this layout. Corner rooms have a smaller window on each of two outside walls.